Last April we had the opportunity to attend the Alimentaria trade fair in Barcelona. This year instead of attending as exhibitors we went one step further and partnered with the fair by participating in the Alimentaria Experience, billed as "an experiential gastronomic space, a sensory and participatory revolution". 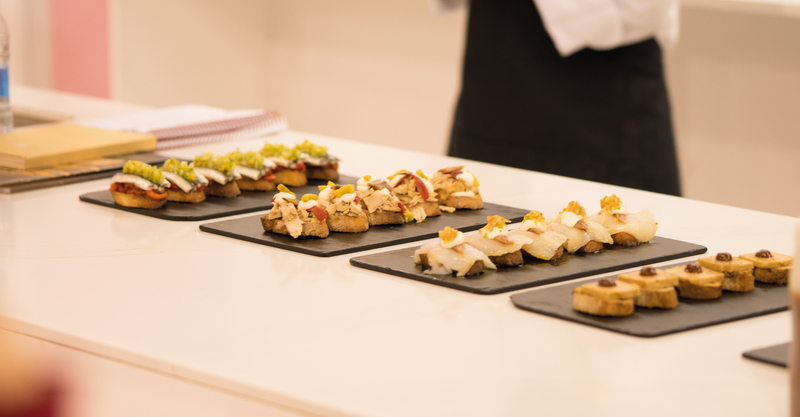 “The Alimentaria Experience is the fair’s gastronomic space par excellence, host to master-classes, workshops and cooking shows. An entertaining proposition designed to arouse the interest of the Alimentaria-going public in the Horeca sector." We believe in promoting close, human and long-term relationships. And therefore decided to make our stand somewhere we could hang out with members of the Okin community, somewhere to savour some of the best Basque cuisine in the form of bread-based Pintxos. To experience real Basque cuisine it was essential to involve those who live and breathe it on a daily basis. And who better than our friends at Grupo Gastroleku from Donostia old town, who’s Pintxos and pairings are a daily marvel. - "Roast beef sandwich" with our Ciabatta bap. - "Foie Mi-cuit" on a slice of raisin and nut bread. - "Marinated anchovy" on a slice of semi-wholemeal Baguette. - "Smoked Cod" on a slice of rustic Txapela. - "Cod au gratin" on a slice of Premiére bread. As part of the programme for Alimentaria Experience, we had the opportunity to provide two presentations in the form of cooking shows, where we shared the bill with eminences such as Andoni Luis Aduriz, Paco Roncero or Elena Arzak. Also accompanied by Iñigo and Paulo from Gastroleku, we highlighted the role of bread in gastronomy. - Bread and its pairing (Monday, 12:00). - Bread-based Pintxos (Tuesday 15:30).